Scotch with Sherry character, not meant to be shared. This bottle holds an elegant 25 years old expression that was predominantly matured in first-fill ex-Sherry casks, which brings exciting woody notes followed by a salted caramel character. It's a well-balanced and elegant classic that should be enjoyed neat in order to taste the extraordinary flavors of a quarter of a century. This is a limited release that was originally meant to be a travel-retail exclusive. It won the Chairman's Trophy Award for Best Speyside Single Malt at the 2018 Ultimate Spirits Competition. 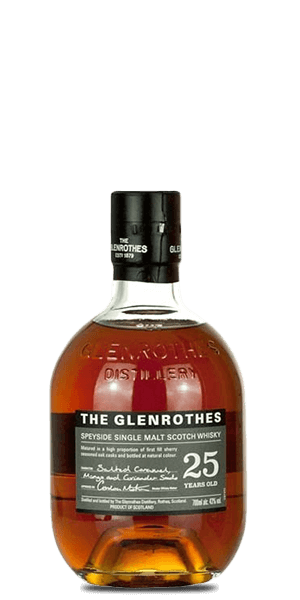 What does The Glenrothes 25 Year Old taste like? The Flavor Spiral™ shows the most common flavors that you'll taste in The Glenrothes 25 Year Old and gives you a chance to have a taste of it before actually tasting it. Lavish aromas of tropical fruits such as mango and pineapple, followed by bold notes of cedar wood. Elegant flavors of coriander seeds and violets with a tinge of salted caramel. Sweet and long-lasting finish with floral and citrus embrace.